All the websites out there will give you the lowest price based on your schedule, but if you care about the comfort and helpful amenities like Wi-Fi and in-seat entertainment, Routehappy will find you the best quality flights. 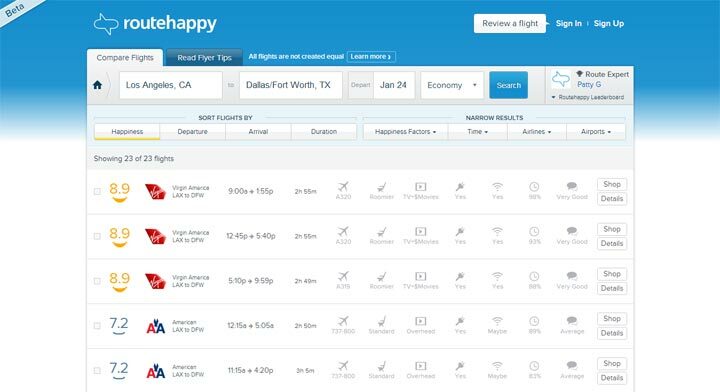 Just enter your flight details and Routehappy will list flights sorted by a unique happiness rating, which is a combination of several factors, including plane quality, seat roominess, flyer ratings, on-time arrival, and more. Note that, currently, you can enter only a one-way flight, and if you need a return trip, you need to search for that part. Then filter the results to your exact needs, like must have Wi-Fi, and you should be able to see the details and then shop around to the airline or another travel site for purchasing.